Identification: Spawning males carry orange-red lines of the cheeks and gill covers. Their bellies and lower fins are reddish. Ear lobes are dark with a pale border. Large mouth that extends to front of eye when closed; spiny dorsal fin with 10 spines, directly connected to soft part of fin; long gill flap with vivid orange spots on the side; medium gill raker length; sides olive colored with fine golden or emerald dots. Becker (1983); Hubbs et al. (1991); Page and Burr (1991); Etnier and Starnes (1993). Native Range: Hudson Bay (Red River), and Mississippi River basin from Ohio to southern North Dakota, and south to Louisiana; Gulf Slope drainages from Mobile Bay, Alabama, to the Colorado River, Texas (Page and Burr 1991). Table 1. States with nonindigenous occurrences, the earliest and latest observations in each state, and the tally and names of HUCs with observations†. Names and dates are hyperlinked to their relevant specimen records. The list of references for all nonindigenous occurrences of Lepomis humilis are found here. Means of Introduction: Usually unintentional stocking as stock contaminant with other centrarchids. Probably competes with young bass Micropterus spp., bluegill L. macrochirus, and crappies Pomoxis spp. for food (Cross 1967). Orangespotted Sunfish expanded its range eastward across Ohio aided by introductions into farm ponds and reservoirs (Trautman 1981). It gained access to the Lake Erie drainage when it overcame a spillway (probably aided by humans) dividing the Wabash (Ohio basin) from the St. Marys system (Great Lakes basin). It then invaded the Maumee River and progressed downriver to Lake Erie (Trautman 1981). Status: Presumably established in all locations. 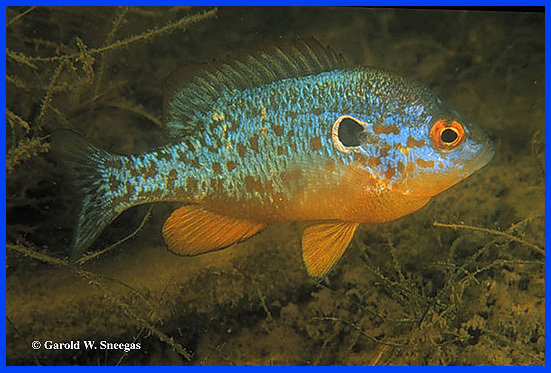 Impact of Introduction: Orangespotted Sunfish probably competes for food with young bass, bluegill, and crappies (Cross 1967). Remarks: Nelson and Gerking (1968) reported that the Orangespotted Sunfish was not collected in the Tippecanoe drainage, Indiana, prior to 1945, but do not directly state that it was introduced there. Stauffer et al. (1995) apparently had no definitive records for this species in the Little Kanawha drainage, West Virginia. However, they indicated that it probably occurred there. The lack of specimens may be the reason why Hocutt et al. (1986) reported this species as probably introduced there. Hegrenes (2001) found that orangespot sunfish exhibit diet induced phenotypic plasticity where fish that fed on small planktonic prey developed an elongate, fusiform shape with a sharply sngled snout. Those that fed on larger prey items developed a taller, deeper bodied shape and a blunt snout. Possibly native to the Lower Great Lakes (particularly the southern ends Lake Michigan), but currently the confirmed native range is just outside the basin boundary. Bailey, R.M., and M.O. Allum. 1962. Fishes of South Dakota. Miscellaneous Publications of the Museum of Zoology, University of Michigan, Ann Arbor, MI 119:1-131. Bailey, R.M., and G.R. Smith. 1992. Names of Michigan Fishes. Michigan Department of Natural Resources 7 pp. Cross, F.B. 1967. Handbook of Fishes of Kansas. University of Kansas Museum of Natural History Miscellaneous Publication No.45. University of Kansas, Topeka, KS. 357 pp. Hassan-Williams, C., and T.H. Bonner. n.d. Lepomis humilis: orangespotted sunfish. Texas State University, San Marcos-Biology Department/Aquatic Station. Hegrenes, S. 2001. Diet-induced phenotypic plasticity of feeding morphology in the orangespotted sunfish, Lepomis humilis. Ecology of Freshwater Fish, 10:35-42. Hocutt, C. H., R. E. Jenkins, and J.R. Stauffer, Jr. 1986. Zoogeography of the fishes of the central Appalachians and central Atlantic Coastal Plain. Pages 161-212 in C.H. Hocutt, and E.O. Wiley, editors. The Zoogeography of North American Freshwater Fishes. John Wiley and Sons, New York, NY. Hubbs, C., R.J. Edwards, and G.P. Garrett. 1991. An annotated checklist of freshwater fishes of Texas, with key to identification of species. Texas Journal of Science, Supplement 43(4):1-56. Kilby, J.D., E. Crittenden, and L.E. Williams. 1959. Several fishes new to Florida freshwaters. Copeia 1959(1):77-78. Mandrak, N.E, and E.J. Crossman. 1992. A checklist of Ontario freshwater fishes. Royal Ontario Museum, Toronto. Ontario Federation of Anglers and Hunters. 2009. OFAH Database - 2009 Download. Owen, J.B., D.S. Elsen, and G.W. Russell. 1981. Distribution of Fishes in North and South Dakota Basins Affected by the Garrison Diversion Unit. Fisheries Research Unit, University of North Dakota, Grand Forks, ND. Stauffer, J.R., Jr., J.M. Boltz, and L.R. White. 1995. The Fishes of West Virginia. West Virginia Department of Natural Resources. Academy of Natural Sciences of Philadelphia, Philadelphia, PA. 389 pp. Swift, C.C., C.R. Gilbert, S.A. Bortone, G.H. Burgess, and R.W. Yerger. 1986. Zoogeography of the Fishes of the Southeastern United States: Savannah River to Lake Pontchartrain. In C.H. Hocutt and E.O. Wiley, eds. The Zoogeography of North American Freshwater Fishes. John Wiley and Sons, New York, NY. 213-266.